Elucidation of diseases mechanisms and development of new therapeutics through generation of gene-modified mice. CADM try to clarify the mutual relationship between gene function and cause of onset for diseases that are a social problem such as autoimmune diseases, allergy, lifestyle diseases, cancer, neurological diseases, and aging by using gene-modified mice of disease related genes. We try to address these big challenges by collaborating with the researchers of biological- and life-science field in TUS. 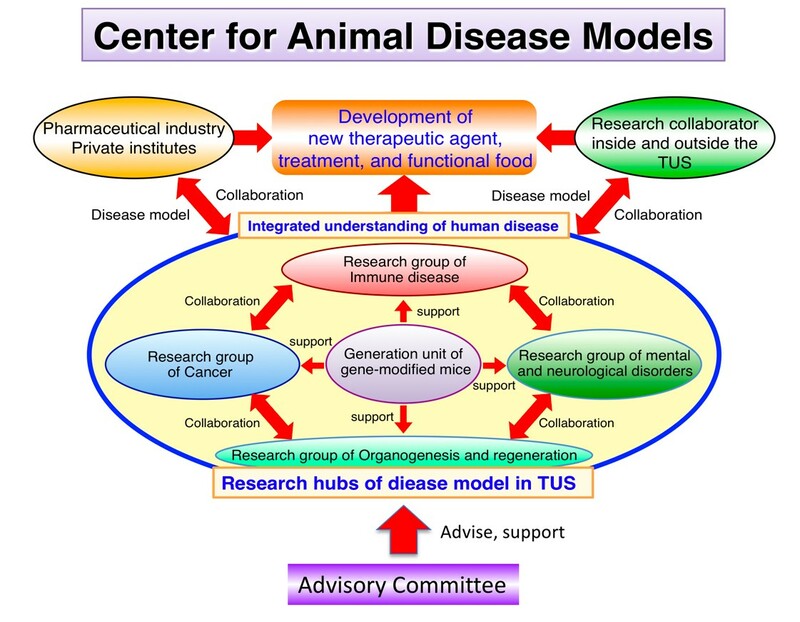 Furthermore, we are aiming to form research hubs of animal model diseases in TUS to develop new therapeutic agent, treatment, and functional food. We are expecting that new therapeutic drugs and therapies will be developed through the activities of this research center. CADM set up a developmental engineering team to support the generation of gene-modified mice in the center and we will promote the generation and supply of genetically modified mice. Each group in the center promotes cross-sectoral collaborative research by sharing gene-modified mice and analytical methods such as animal disease models. 1. Immune Disease Research Group (Yoichiro Iwakura, Masato Kubo, Daisuke Kitamura, Haruo Kozono, Tomokatsu Ikawa, Shuhei Ogawa, Ce Tang, Soo-Hyun Chung, Sachiko Kubo, Yosuke Harada, Yoichiro Isohama, Chiharu Nishiyama) Based on the generation and functional analysis of gene-modified mice of the genes such as inflammatory cytokines, innate immunity receptors and signaling factors, we aim to develop novel therapeutic agents and functional foods for autoimmune diseases and allergies. carcinogenesis. Finally, we aim at application to cancer therapy. This group analyzes the mechanism of the onset of mental and neurological disorders by using animal disease models caused by dysfunction of neural circuit formation related gene. This group aims at application to therapy of mental and neurological disorders. This group investigates the mechanism of cancer development at the molecular, cellular, organ, and individual levels by generation of gene-modified mice involved in the onset of cancer. This group aim to develop anticancer therapy by elucidating the functions of responsible gene. To get more insight into disease pathogenesis and to develop new therapeutics through cross-research field collaboration in Noda area. The homeostasis of our body is maintained through concerted actions of many genes. Therefore, it is critically important to elucidate gene functions in order to develop new therapeutics. I believe that we will be able to develop novel drugs and therapeutics through the collaborations of our research groups.